The progress on the stadium for the 2018 World Cup certainly is coming along! 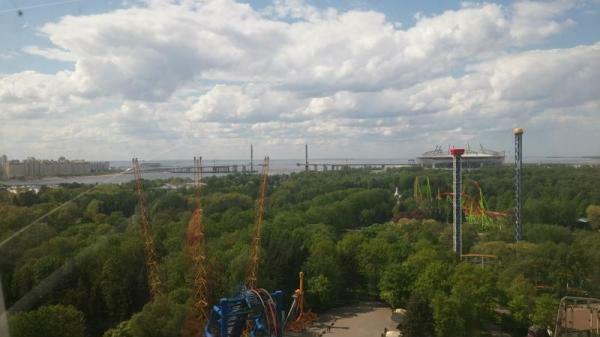 The first picture was taken in the summer of 2016 from the ferris wheel in Divo Ostiv amusement park, which is also located on Kristovsky Ostrov. In addition to the amusement park there is a huge fountain, petting zoos, several restaurants and lots and lots of room to walk and explore. Kristovsky Ostrov is a fantastic place to visit to see where every day Russians go to relax and enjoy the sunshine. If you’re interested in something a little off the beaten path, be sure to contact me and ask me about a visit to this wonderful place! The second picture was taken in January of 2017 from the bridge that was recently completed. 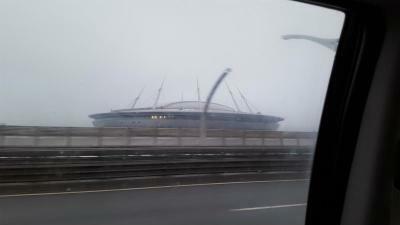 It allows for comfortable traffic flow to the stadium and is also part of the bypass that now circles St. Petersburg.